What Is a DA Form 5888 1? DA Form 5888-1, Screening of Family Members in Remote OCONUS Areas is a form used for determining the need to file the DD Form 2792 (Exceptional Family Member Medical Summary) and DD Form 2792-1 (Exceptional Family Member Special Education/ Early Intervention Summary). The latest version of the form - sometimes incorrectly referred to as DD Form 5888-1 - was released by the Department of the Army (DA) in November 2006 with all previous editions being obsolete. An up-to-date fillable DA Form 5888-1 is available for download and digital filing down below or can be found on the Army Publishing Directorate website. DA Form 5888, Family Member Deployment Screening Sheet is a related form used for validating family member deployment screening and providing the gaining command with data to assist in making an assignment decision. The DA 5888-1 is attached to the DA 5888 before submitting. How To Fill Out Da Form 5888-1? For use of this form, see AR 608-75; the proponent agency is OACISM. DD Form 2792-1 (Exceptional Family Member Special Education/Early Intervention Summary). or disciplinary action against the Soldier. 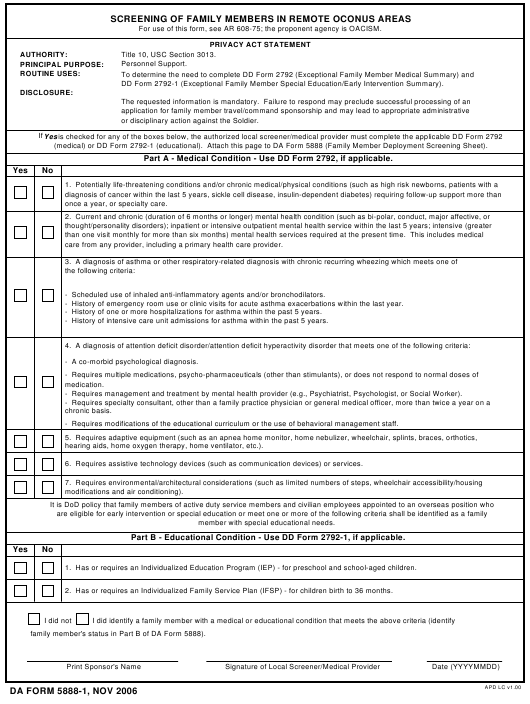 (medical) or DD Form 2792-1 (educational). Attach this page to DA Form 5888 (Family Member Deployment Screening Sheet). Part A - Medical Condition - Use DD Form 2792, if applicable. once a year, or specialty care. care from any provider, including a primary health care provider. - Scheduled use of inhaled anti-inflammatory agents and/or bronchodilators. - History of emergency room use or clinic visits for acute asthma exacerbations within the last year. - History of one or more hospitalizations for asthma within the past 5 years. - History of intensive care unit admissions for asthma within the past 5 years. - A co-morbid psychological diagnosis. - Requires management and treatment by mental health provider (e.g., Psychiatrist, Psychologist, or Social Worker). - Requires modifications of the educational curriculum or the use of behavioral management staff. hearing aids, home oxygen therapy, home ventilator, etc.). 6. Requires assistive technology devices (such as communication devices) or services. member with special educational needs. Part B - Educational Condition - Use DD Form 2792-1, if applicable. 1. Has or requires an Individualized Education Program (IEP) - for preschool and school-aged children. 2. Has or requires an Individualized Family Service Plan (IFSP) - for children birth to 36 months. family member's status in Part B of DA Form 5888). The form consists of two parts - Parts A and B, containing 7 and 2 questions respectively and boxes with yes or no questions. Part A - Medical Condition, may require using the DD Form 2792. The DD 2792 is applicable in case any of the answers in the section were positive. Question 1 asks if there are any potentially life-threatening conditions or chronic medical or physical conditions that a dependent may have that may require special assistance. These include high-risk newborns, patients with oncology, etc. Question 2 is about any current and chronic mental health conditions that may require mental health services. Question 3 covers severe degrees of asthma and other respiratory-related diagnoses with current recurring symptoms or with a history of frequent emergency room use. Question 4 is about ADD or ADHD patients. Question 5 determines if there is any need for adaptive equipment. Question 6 determines a need for assistive technology devices. Question 7 is about any need for environmental or architectural considerations necessary for the dependent. Part B - Educational Condition, may require filing the DD Form 2792-1, if applicable. Question 1 determines if there is any need in an Individualized Education Program for preschool and school-aged children. Question 2 is meant to determine if there is a need in the Individualized Family Service Plan, for children up to 36 months. This form is a part of a series of forms for enrolling in the Exceptional Family Member Program (EFMP). The EFMP is an obligatory program that works with other military and civilian agencies to assists Families with special needs. This includes providing housing and educational benefits, medical assistance and other services. This program is available for Active Army and Soldiers in the USAR Active Guard Reserve Program. The MTF - Medical Treatment Facility - is the party through which the EFMP enrolment process is done. The DD Form 2792 is to be completed to determine special medical needs and the DD Form 2792-1 is filed to determine educational needs. The EFM enrolment process is subjected to regular updates, no less than once every three years or whenever the conditions change. The information provided within all forms is prohibited from disclosure. Only authorized personnel has the legal power to have access to the information. EFMP enrolment may affect further assignment locations but will not have an effect on the career. Family members can opt out of the program once they no longer require the help and benefits. The process of quitting the program is similar to the process of enrolment. The final decision is made by an attending physician.